I have such a treat for you today. And I'm so thrilled over the moon for this book, I might just leave it here for the remainder of the week so it doesn't get lost in the holiday shuffle. I think I'll do Cool Stuff over the weekend or on Monday and some cookies later on next week. This beauty needs to just sit and BE here for a while. 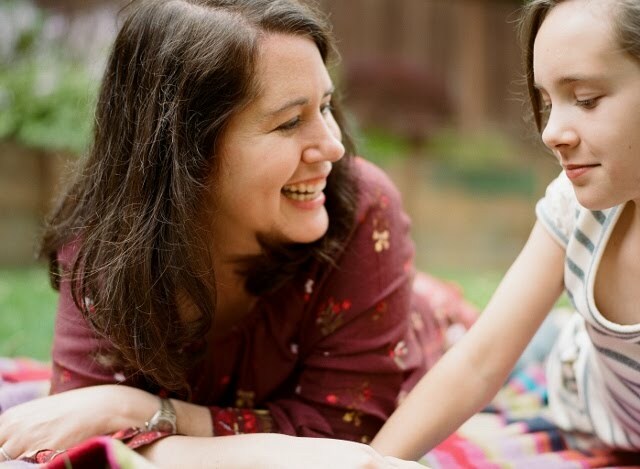 So my friend Laura, who I mention a lot on this blog, is a darling friend that I've known since I was seven - we grew up together in Hawaii and we both are book fanatics. 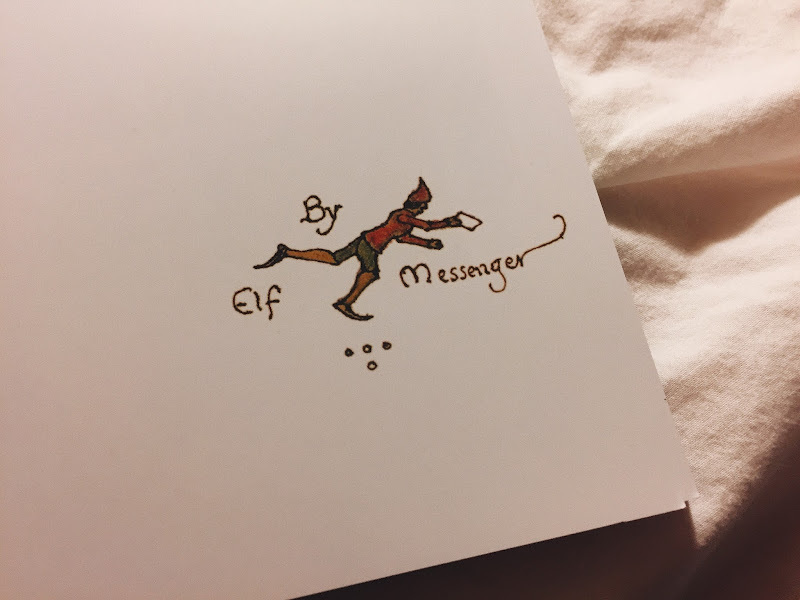 She's a good and loving friend to books, and to me, and she very kindly lets me know about things like this, and other magical happenings, and books, and things of interest that she thinks I should know about. If I could thank Facebook for only one thing, it would be bringing Laura back into my life (we lost touch with each other when she moved away from Hawaii mid-way through high school). 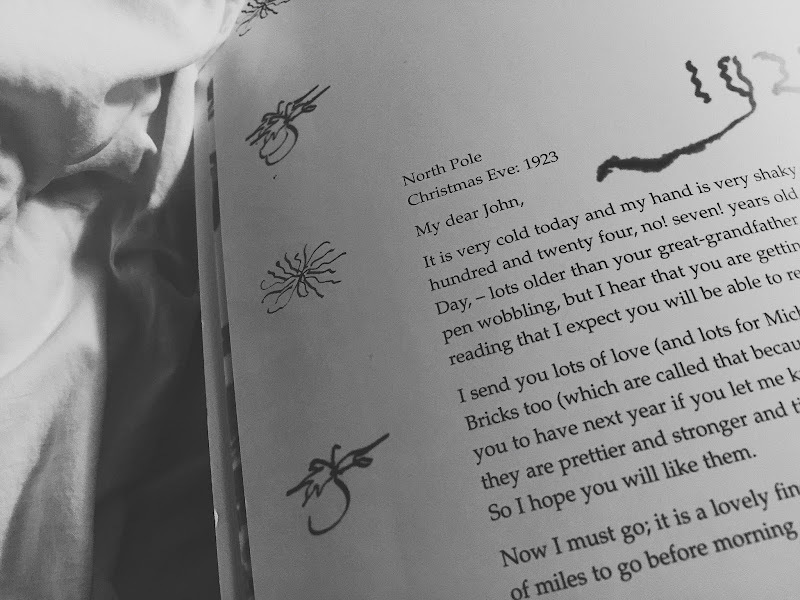 Anyway, Laura has been after me for years to get on with reading 'Letters from Father Christmas' by J. R. R. Tolkien. She was stupefied when I said I had never read it. I had never even seen it! Every so often, this book would come up as we wrote to each other and chatted and she was like 'YOU. MUST. get this book. WHY do you not have it.' At least a couple of years, maybe three, she's been telling me this. Sometimes it takes me awhile to get things in motion. Like picking up my finger and pressing 'order'. 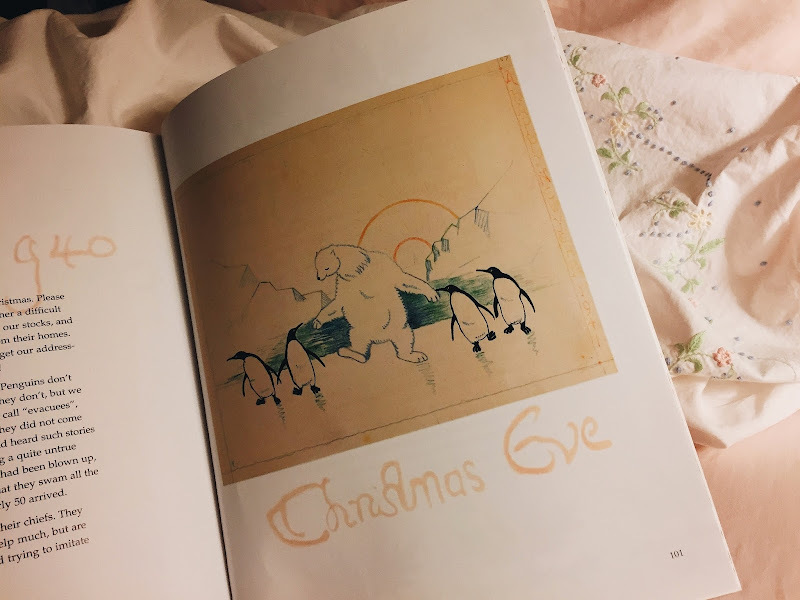 But after agonizing over which copy to get (there are several editions available and Laura has a vintage copy, which is not widely available, so I had to kind of wing it when deciding what to get!) 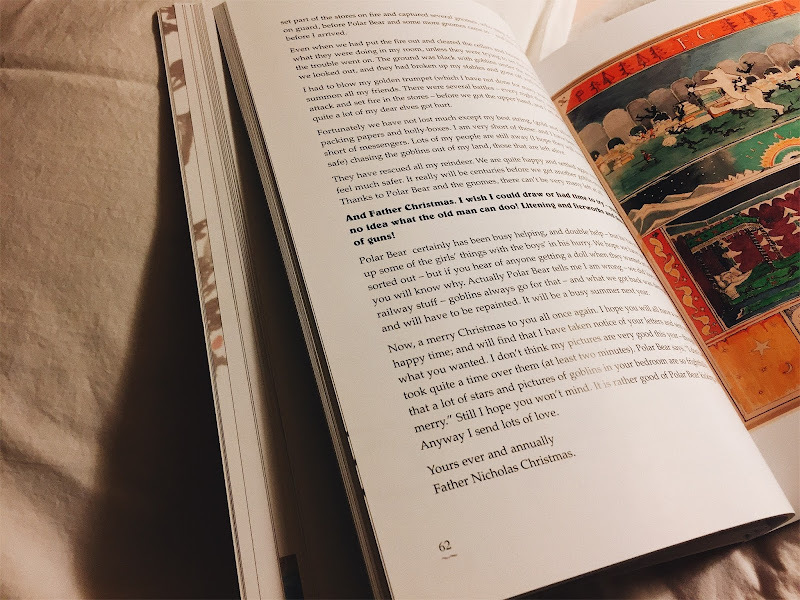 - thankfully I chose wisely and the book fairies delivered the copy you see here in this post, and I couldn't be more thrilled. Let's talk about the book! 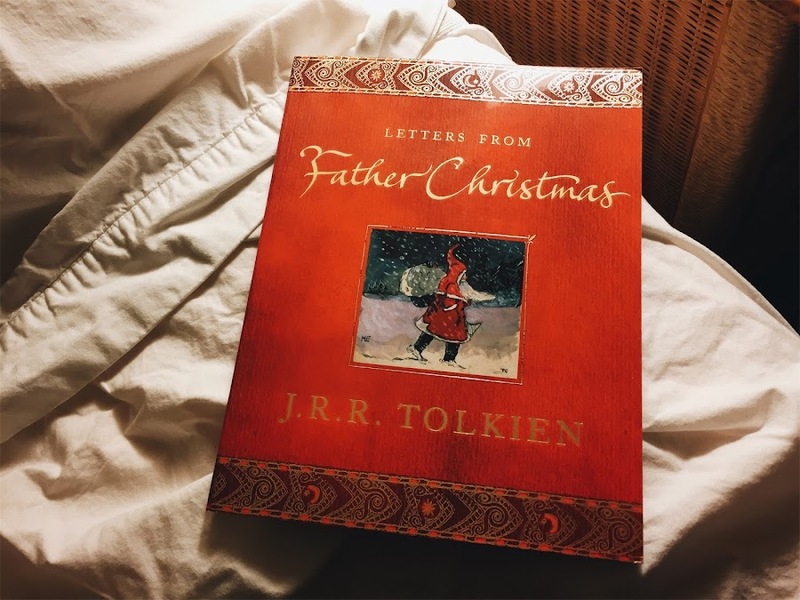 Tolkien wrote the letters over a number of years to his four children, and as he was writing his letters, he was also writing his other published works, like 'The Hobbit'. 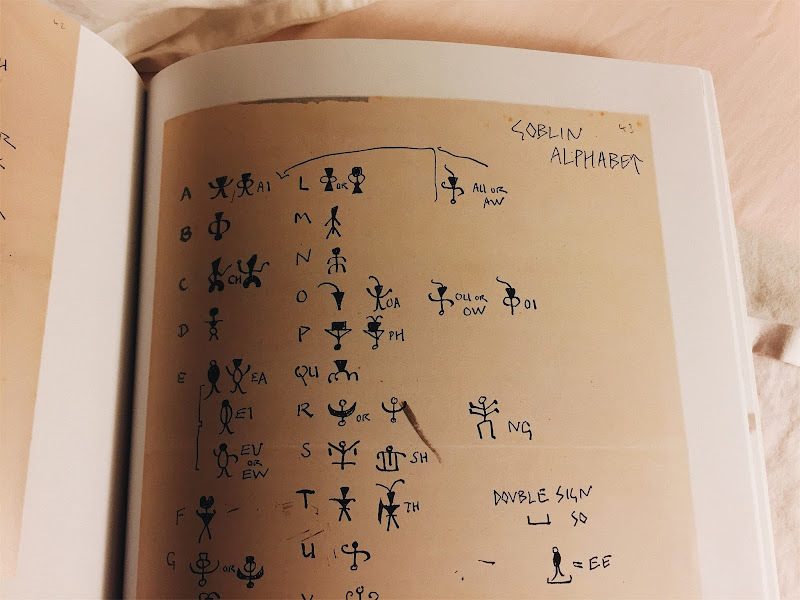 Tolkien scholars (I am not one of them) have discussed how if you're an avid Tolkien reader, you can see elements from the letters that he put into 'The Hobbit' and elements from 'The Hobbit' that he put into the letters. As well as material seen in other works. Blah blah blah scholarly themes that may flow between his works do not really interest me. 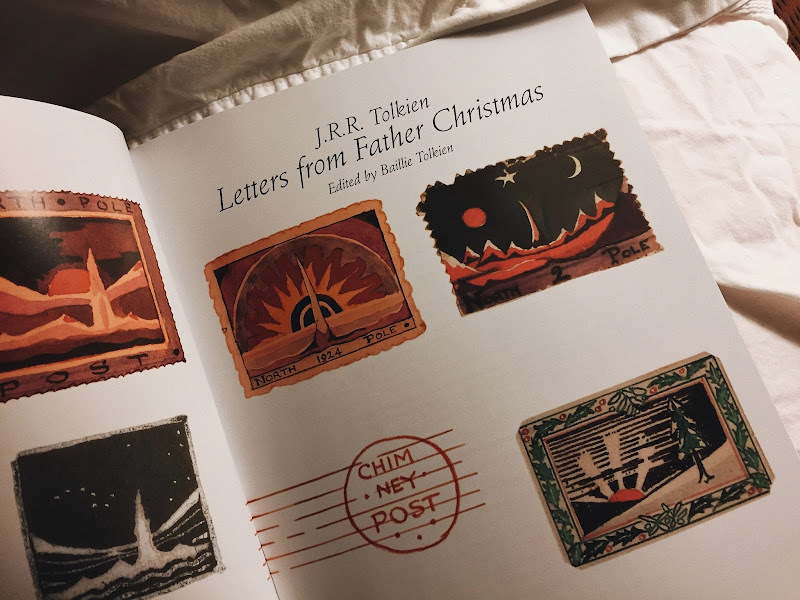 What interests me is that this collection of letters Tolkien created for his children as they grew up is FLIPPING AMAZING. I have no idea what kind of father he was really, and I know next to nothing about his life, but if this creation is any indication of what kind of father he was, well, color me impressed. 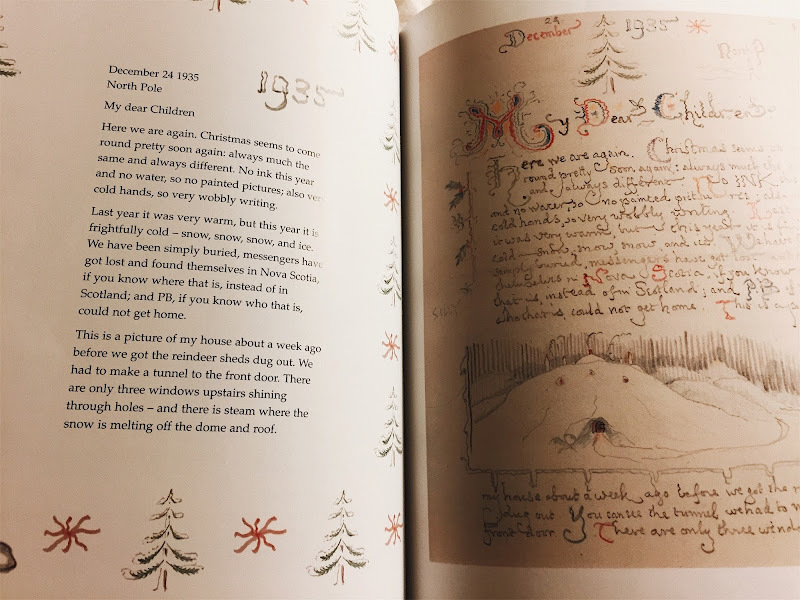 And speaking of that insane calligraphy, which can be a bit tricksy to read - what's nice about the book is that it shows you the actual letters on one page, with the typed text printed out on the opposing page, so you don't have to strain your eyes trying to figure out his handwriting. 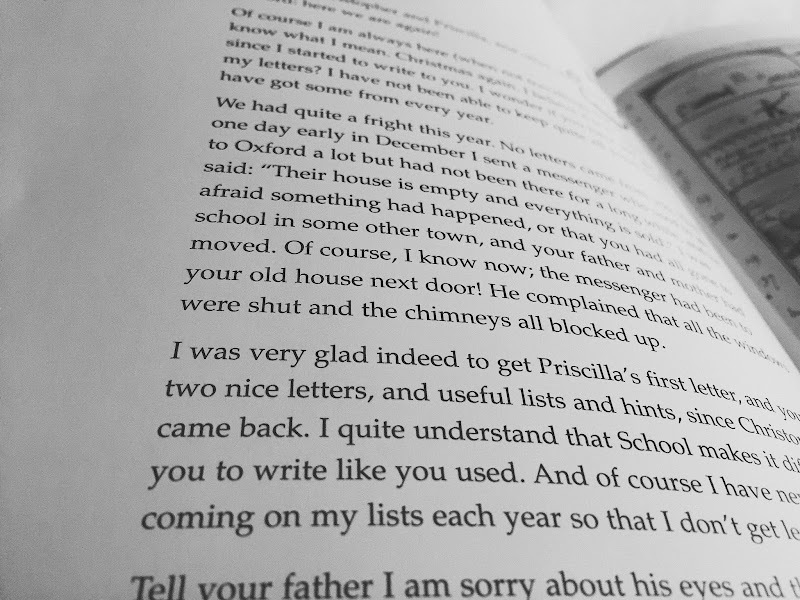 What's really fun about the letters is that they start off simple and short, as they were written when his kids were quite small, and as they grow, so do the stories in their complexity. 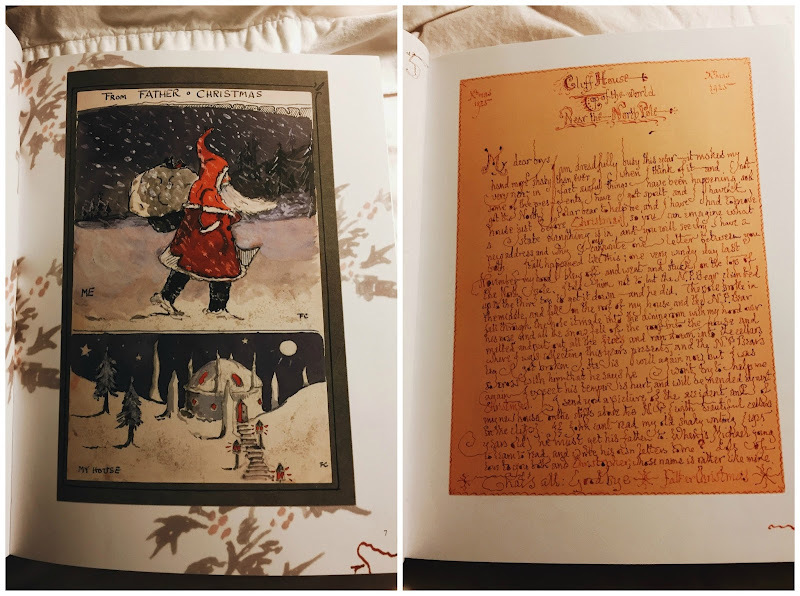 The letters are just that - very conversational and chat-like - and within each letter, Father Christmas tells tales of what's being going on in the North Pole. Most of his stories prominently feature his main assistant and best friend, the North Polar Bear, who is a bit of a bumbling fool. 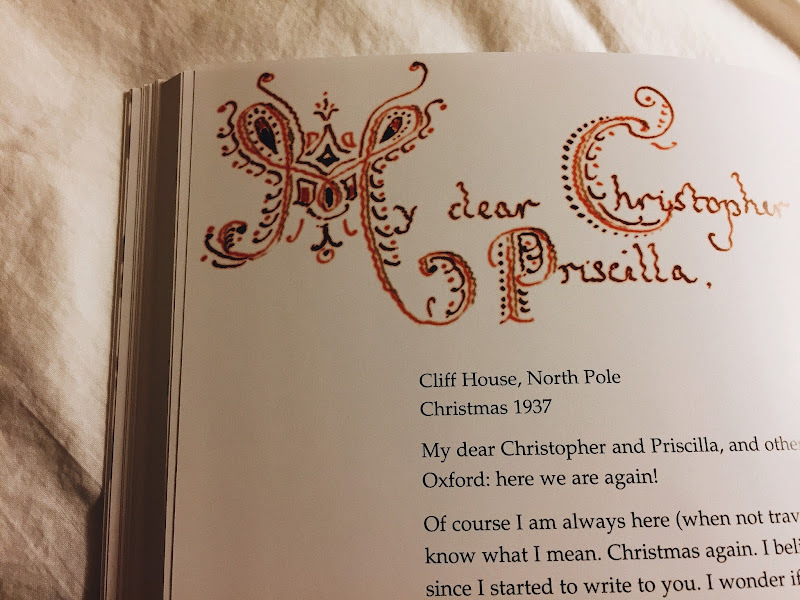 The North Polar Bear also takes it upon himself to jump in and write many portions of the letter himself - especially when he feels the need to contradict some point Father Christmas is trying to make. 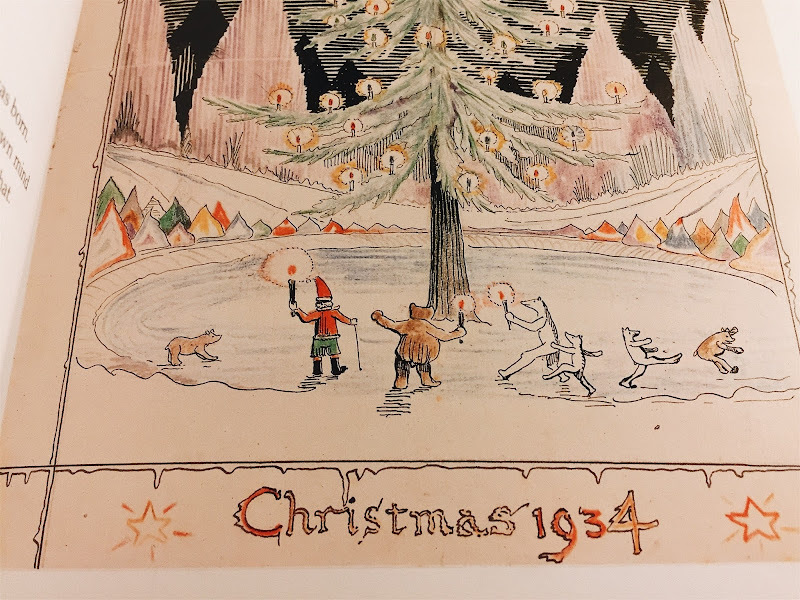 One year the mischievous polar bear went and lit off Father Christmas' entire stash of holiday fireworks, thus creating an incredible light show that greatly resembles a gorgeous Aurora Borealis. Another time he climbs the North Pole and then falls through the roof of Father Christmas' house. He's naughty and hilarious and a troublemaker, and we love him. This is a magical creation of a book. MAGICAL. The details! Written and drawn! Now that I actually have it living in my house, I'm amazed and horrified that it took me so long to get around to getting it. So much imagination and love went into this book. 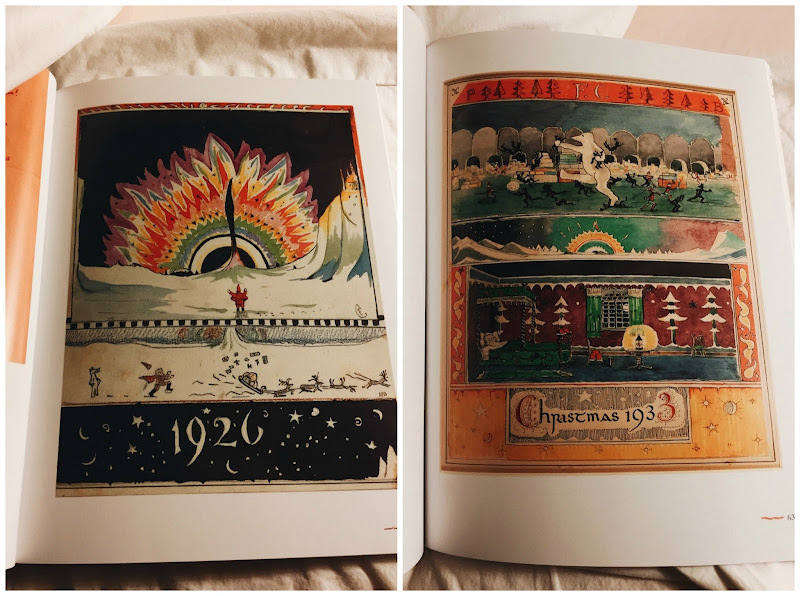 The letters span from 1920 to 1942 and they are as charming as the day is long. You know I really get shouty only about a select few books these days - I don't have time to blog as often, and I only want to blog about what I find to be really, truly, ultra special. Do yourself a favor and get this one a lot sooner than I did - it needs to be in your permanent collection. This book makes me want to laugh and sing and cry over its beauty. This book looks amazing! I'm coming to the realization that when it comes to books-where Melissa goes, I'd be smart to follow! I placed my order, and while I won't get it till after Christmas, I think it will be a lovely way to extend the holiday season. Thanks for posting about this! aw Maureen that's so sweet and kind of you to say!!!! I think you'll really enjoy this so much - and we're going to keep reading it past Christmas! Totally lends itself to 'Winter' in general. And aren't after-Christmas treats just the best?? Prevents holiday letdown syndrome ha ha ha. This is MAGICAL. The illustrations alone are so beautiful. Love this, Melissa!!!!! isn't this the coolest?! I was telling some people in a photography group i belong to on Facebook about the colors in the art. I feel like his use of color was very bold and modern. Oh My Goodness!!! In the past I may have uttered the arrogant phrase "I have read everything Tolkien has written" because I thought I had (even his collected letters and some scholarly stuff), but I have never heard of this book before. Shame on me. I can't wait to get my hands on this book. Thank you, thank you, thank you for sharing. If you can't tell, I am freaking out just a little bit. YOU ARE SO WELCOME!!!!! Next year, I'm giving this in multiples as gifts to people. I truly believe everyone needs to own it!! Hey Amber! 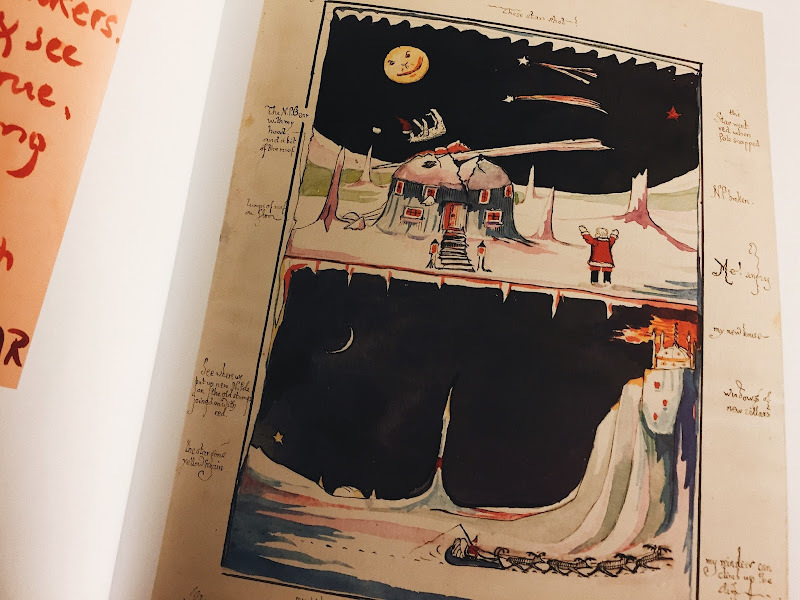 I did not know that - I also just found out about a little picturebook he did called Mr. Bliss that looks very interesting. I'm a huge E. Nesbit fan. I'm telling you, I read the Hobbit and a good chuck of LOTR but I was never a huge mega fangirl for Tolkien. I feel like now I want to read everything he's done! Melissa, I am so glad you now own this beauty! Your words brought tears to my eyes, my friend. I love that we can talk about books as adults, as we did as kids. Love you! oh you will, i swear!!! the art is even BETTER!